I almost feel cheated that I didn't know how fun felting would be til now. I mean, I read about it all the time but I'm one of those, you spent all that time knitting and you go and ruin it?-types, but not anymore :) I still can't believe that this floppy, sorta sloppy knit thing has turned into a tough, thick fabric without much doing. 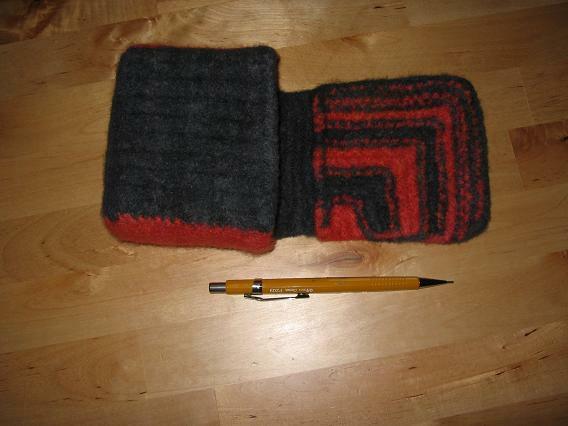 The bag has shrunk from 6.25" w to 5" wide total (incl. 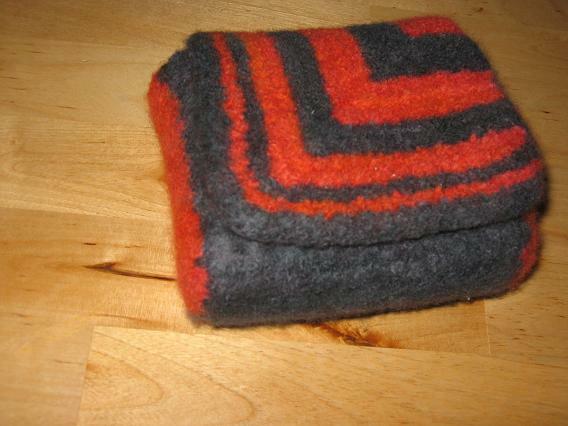 a little smooshing, same as pre-felting measurements), the mitred square started life as 5"x5" and is now 4"x4", and the depth remained the same (1.5"). 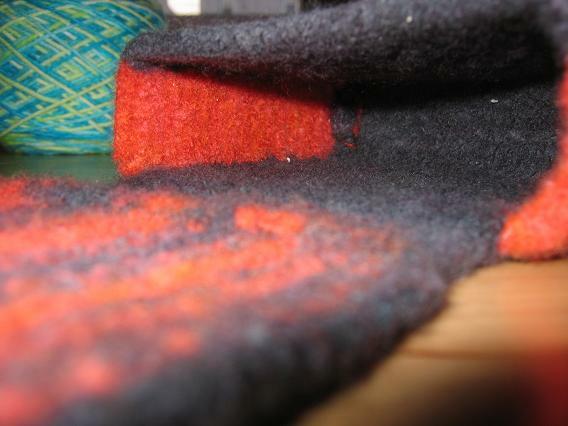 So that's a pretty even 20% felting - shrinkage rate, not incl. the depth of the bag itself (as I stretched it out). To wit, the garter strip that attaches the mitred square to the back flap of the bag was 1.25" to start and is now 1", so again the shrinkage was 20% when not pulled/molded into a different size. I managed to mold it into this square shape I really wanted it to have (square bottom, square solid sides) by inserting a very very tight fitting piece of crafting foam inside and letting it dry around it. The foam was actually a little wider than the side panels, so a bit of the black back & front panels have a 90 degree turn in them, not the red. (Seen in the peekaboo pic below). I think it would stand on its own, if it weren't front-heavy with the flap. 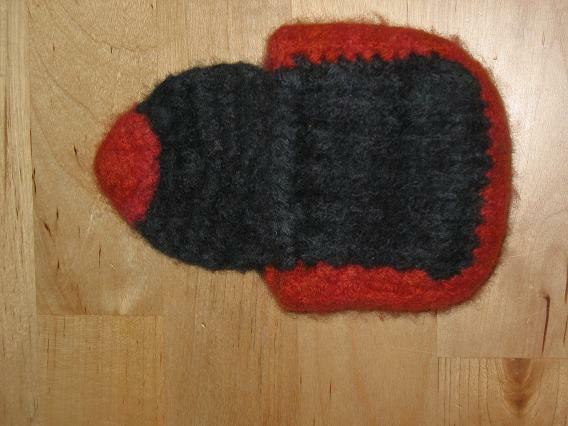 I am personally thrilled to see that I can mangle the felted item into any shape I want. I can't decide (haven't) if I am going to knit the straps all the way up from the side panels without stopping, or if I will create a little loop/long bit and attach them with a ring or something. I'm not looking to make it adjustable or anything so I don't know why I'd add a ring attachment but for looks, but I'm going to keep my eye open for something in that neighborhood before I make a decision. I think the final bag's going to be 3x this size, aiming for a 12x12 flap. The bag I'm modeling the size after is that width but isn't as deep; the mitred square keeps my options closed in making it less so. I cast on 33 sts (k 15, k3tog, k 15/k back -- k 14, k3tog, k14/k back etc.) so it'll probably be 93 sts (k 45, k 3tog, k45) and I'll work the pieces from there. It is kinda deep (12"), but I want to be able to carry magazines/legal pad sized paper in it so... not much option there. Maybe I'll consider a less wide bag. I'll also change the mitred square pattern, don't know what to yet tho. I also haven't decided if I will use a closure on the flap.